Do you ever look around at the world we’re living in and ask yourself, what is actually going on here? We’re in times of rapid change, of ever increasing complexity and the demands on our attention, energy and bodies seem ceaseless. More and more people are wanting to lead lives of meaning and purpose, longing to make a difference and create change where it’s needed. For those of us who always seem to be working a developmental edge, who are reaching into new potentials, the question of how to develop dynamic resilience is a pressing one. As it turns out, this question of what we need to develop in ourselves in order to be able to show up fully for what’s being asked of us, is the question that so many are living. So we, at Integral Coaching Canada, have gathered a bunch of them into a digital meeting place to explore the themes and topics that are so pressing to us. What are the greatest challenges leaders (and we’re all leading something) are facing in the times we’re in and what capabilities are needed to resiliently respond to these challenges? How can we effectively navigate the complexity and dualistic nature of being alive right now, from the longing for great achievement, drive and success to the tender ache for rest, healing, and connection? Are these questions of relevance to you? If so, join us! 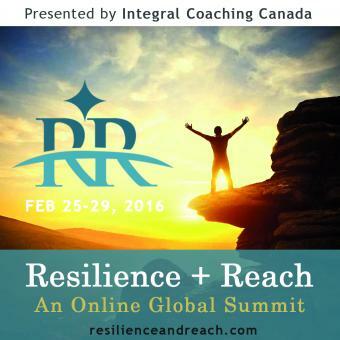 Register for free access to the Resilience + Reach Global Online Summit presented by Integral Coaching Canada, February 25-29, 2016.